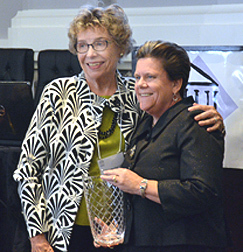 We are proud to announce that our friend and colleague, Kathryn Smith Root, received the 2014 Oregon Women Lawyers’ Katherine H. O’Neil Volunteer Service Award. Kathy is a true and dedicated leader who has devoted her professional career to assisting others. Her 30 years of managing various charitable and professional pursuits, pro bono counseling, and work as a family law attorney made her the perfect candidate. This award recognizes sustained contributions of service in an identified position with OWLS or an OWLS chapter, the Oregon Women Lawyers Foundation, the National Conference of Women’s Bar Associations, the National Association of Women Lawyers, or the ABA Commission on Women in the Profession. Kathryn is also a proud founder of OWLS. Her ongoing commitment to promote women and minorities in the Oregon legal profession is profound. Kathryn is a sought-after mentor, and currently serves as Chair of the OWLS Foundation Advisory Board. Congratulations, Kathryn on this well-deserved honor! Read more about Kathryn HERE.